Even 30 years ago, bourbon was not recognized as a spirit worthy of any special distinction or any especial celebrity. People who drank bourbon were essentially bums and layabouts who were looking to get drunk on a hard liquor that was cheap and easily found in and around Kentucky. Today, bourbon’s pride of place as America’s worthiest alcohol export belies the story of its less-than-glorious past. 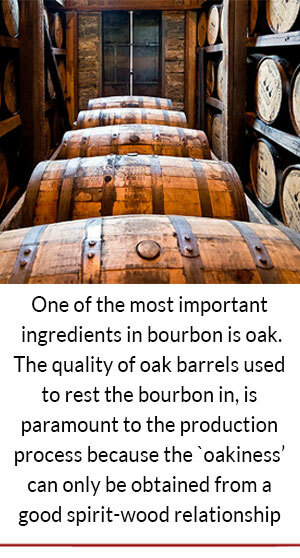 Recognized by the Congress as `America’s Native Spirit’, with total sales at nearly $3.7 billion dollars a year, bourbon can be a desirable craft spirit that connoisseurs are willing to buy at any premium nowadays. Wildwood Spirits is a micro distillery in Bothell, Washington, that is one of the few establishments left in America that still believes in the artisanal philosophy of fractional distilling, and has already produced two award-winning spirits that lay claim to uniqueness because of their seasonal and hyper-local botanicals: Kur Gin and Stark Vatten Vodka. 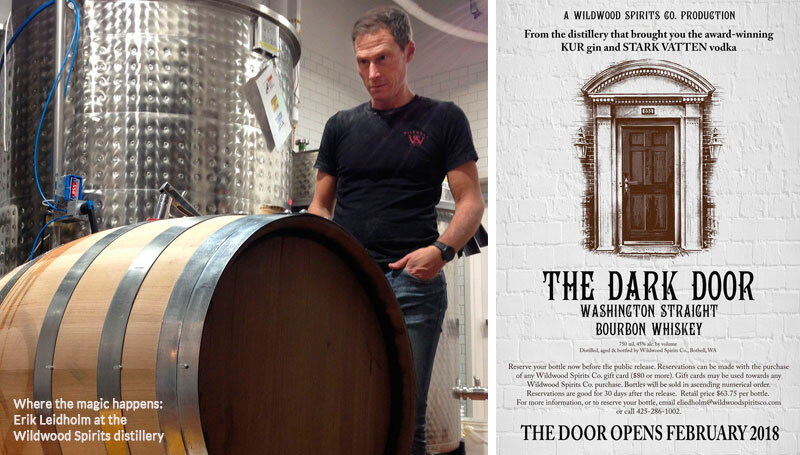 The next big news coming from Wildwood Spirits is `Dark Door’ – a wheated bourbon that exemplifies Erik Leidholm’s commitment to limited edition production of world-class spirits that are carefully reciped and handcrafted to perfection. After Stark Vatten Vodka, Kur Gin and Läka Gin, one has come to expect European-sounding, exotic product names from Wildwood — the same way we expect every furniture line from Ikea to be called Friheten or Djursbo or Ypperlig. Erik Liedholm laughs at the suggestion, pointing out that while gin and vodka can trace their history back to Europe, bourbon was a true-blue, all-American spirit. “While thinking about names for the new bourbon, I recalled the dark wood door at my parents house,” he says. “I remember coming back from school every day and facing that large, imposing door that seemed to hold deep, dark secrets. Whether it was cloudy or sunny outside, that imposing, polished door never lost any of its grand majesty and it still looms pretty large in memories of my childhood days. Isn’t that just the kind of futuristic, alternate reality promise of an extraordinary experience that all spirit connoisseurs are always willing to get first dibs on? Especially if Erik Liedholm himself is on the premises to guide you, teach you, and inspire you to be a more discerning connoisseur than you ever hoped to be.